Nuri Abu Sahmain, Muslim Brotherhood President of the newly elected Congress has summoned militias allied to the Brotherhood to the capital to try to prevent a coup, in a move the opposition sees very much like a coup by the Brotherhood. The main opposition party, a center-right National Forces Alliance, as a result just deserted Congress together with several smaller ethnic parties, leaving the Brotherhood’s Justice and Construction party heading a government with crumbling authority. “Congress has basically collapsed,” said one diplomat in Tripoli. The Obama Administration has promoted a takeover across the Muslim world from Egypt to Tunisia to Syria by the secretive Muslim Brotherhood as part of its long-term strategy of controlling the Muslim Arc of Crisis from Afghanistan to Libya. As the Saudi-backed military coup against Brotherhood president Muhammed Morsi in Egypt in July showed, the Obama strategy has some problems. The Obama Administration argues that the not-yet-proven use by the Assad government of chemical weapons in Syria justifies a bombing war by NATO and allies such as Saudi Arabia, Qatar, Turkey and Jordan, based on the “humanitarian” doctrine deceptively known as “responsibility to protect,” which argues that certain violations of human rights or safety are so serious as to transcend international law, UN Charters or US constitutional requirements and allow on moral grounds any US President to bomb any country he or she chooses. 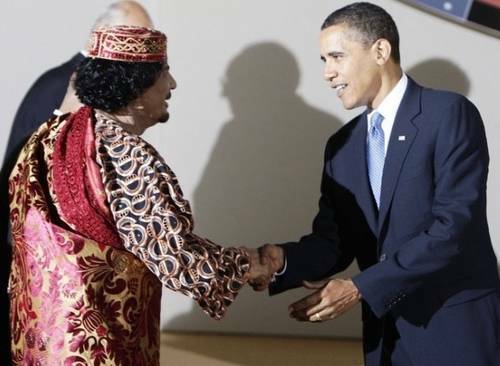 This entry was posted in Neoliberalism, NWO, Obama and Company, Region: Africa, War and Peace and tagged lybia, obama, oil wars, Qaddafi, War Crimes. Bookmark the permalink.